Missionaries of the Catholic faith and French explorers came into the Illinois country together. The missionaries, a most devoted group, came to convert the Indians to Christianity. The explorers came seeking to discover the resources o£ the new country and the opportunities it offered. The explorers, as explorers must, kept moving onward. The men of the church paused to establish missions or centers that would enable them to go about their work in a more systematic manner. Tradesmen coming later often would locate about these mission centers. Officials and emissaries of the French government stopped here. Thus it was that the missions established by the church and afforded a measure of protection by the military, became permanent settlements. Few such settlements survive except in name. One mission, however, has continued its existence through the years since its establishment on May 14, 1699. This one is the Parish of the Holy Family at Cahokia. 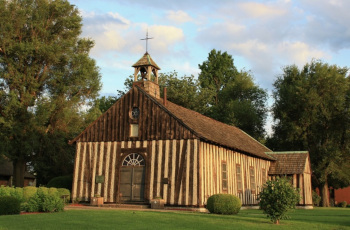 Though the original log buildings of this mission have been rotted away for a couple of centuries, some of the relics preserved in the present log church have close connection with the mission that Father Cosme established. Allowing the curiosity aroused by this old building of walnut logs to function, an inquisitive visitor of today will soon begin to glean bits of the long and interesting story centered about the old church. The age of the structure alone makes it of interest to many. The present building erected and dedicated in 1799, an even century after Father Cosme had set up the first mission, is among the very oldest, if not the oldest church building in the Mississippi Valley. This log structure does not conform to the usual pattern of such buildings. Instead of the logs being laid horizontally—then practically the universal method except among the French—they are arranged vertically. The ends of these vertical logs, hewed both inside and out, are mortised into other shaped logs lying along the bottom and top of the wall. The matching edges of the vertical logs have wide grooves in them about two inches deep in order to retain the mortar and stones used to chink and daub the openings. The corners of the building are sturdily braced. Also, the logs of the wall are leaned inward about eight inches, better to withstand the thrust of the roof trusses. All these combine to give the building a restrained and rugged appearance. The floor slopes gently, about six inches, from the doorway to the altar. There is no ceiling. The graceful and well-proportioned trusses that support the roof are of hewed timbers and show skilled workmanship. Bronze plaques and printed legends at appropriate places highlight some of the church’s history. Emblems used in the worship service of this and of the preceding churches and mission are distributed about the room. The old pews are gone as are the charcoal foot warmers, but candles still are kept burning at the altar. In the dim light and quietness, it is not difficult to conjure up scenes of the earlier years. These scenes are peopled with a motley group that included stolid, blanketed Indians, French settlers with their kapots and blue handkerchiefs, Indian traders, coureurs de bois, explorers, adventurers, hunters, the local French gentry and robed priests that ministered to the local citizens and Indian tribes of the area. In the 264 years since the establishment of the mission that is now the Parish of the Holy Family, this old church and its predecessors at about the same spot have seen a motley crowd pass. The church buildings now serving the parish along with the older ones each have their own interesting stories. The early burying ground with only a few markers remaining lies behind the old church. An appropriate memorial stands near the center of this spot. A bronze plaque on the memorial says: “Ancient burial grounds of the Holy Family Church of Cahokia. Here were interred from the earliest days of the settlement to about 1840 the departed of this parish and here they He in peace.” This is the oldest marked burial ground for white people in Illinois. In 1839 a new burial ground was selected east of the first one. At one time about two thousand Indians lived in the vicinity of the mission. Groups often were encamped on the plot of open ground in front of the church. It was on this spot that George Rogers Clark, after his conquest of Illinois in 1778, conferred with various Indian tribes in an effort to have them become friends and allies o£ the American colonists. On this same plot in front of the church, services were held on May 14, 1949, to commemorate the founding of the mission just 250 years before. Pontifical high field Mass was celebrated by Cardinal Stritch of Chicago. The whole proceedings were magnificent and impressive. From the stone steps in front of this log church and its predecessor, proclamations, announcements, edicts, and sales were made, and public discussions were held in accordance with French practices. Now it is only on rare occasions that services are conducted in the log structure. A few years ago, about 1950, a thorough restoration of the old church was undertaken. The siding that had covered the logs for fifty years or more was removed. Needed repairs and a few replacements were made. The wood was thoroughly treated to ward off decay. In fact, everything known was done to have the building stand for another century and a half or even longer. This old church may be considered as a kind of national memorial. The roster of devout men who have served it is a long one. Those who should receive the most credit for its restoration are Father Joseph Mueller, parish priest; Joseph Desloge of St. Louis; Guy Stady, St. Louis architect; and the Most Reverend Albert R. Zuroweste, Bishop of Belleville. Anyone interested in the early history of southern Illinois can well afford to pause as he drives on Route 3, a few miles south from East St. Louis and visit this picturesque church.